Regular readers will know that 99% of what I write is positive, but I also feel an obligation to be honest and not shy away from sharing what I don’t like from time to time. This post is also void of the usual wow photos of the castle that you’re used to seeing. They were all taken before I got into photography and represent a more realistic view of the castle. The “fairy tale” castle which inspired the Disney castle is visited every year by 1.4 million visitors. In the summer it can receive up to 6,000 visitors a day. The irony being that the castle was not designed for royal representation, but was to be Kind Ludwig II’s retreat – his place to escape to the poetic world of the Middle Ages. I totally get why people want to visit Neuschwanstein Castle. I insisted on visiting it on my very first trip to Germany, despite J.P. (my now German husband) insisting that there were much more worthwhile castles to visit. I didn’t care, I hadn’t heard of them and wanted to visit the fairy tale castle built by the crazy king. Entrance is by guided tour only. I don’t find that a problem in itself, but groups can be up to 60 people in size (way to big for my tastes). Furthermore the tour only lasts about 30 minutes. I literally felt like I was being rushed through each room, with only perfunctory information. There was no time for story telling, done on other castle tours, like Ludwigsburg, my favorite castle tour in Germany and it’s the stories that really bring a castle to life. Photos aren’t allowed inside, hence why only outside photos are featured in this post. Most of the castle isn’t finished. Only a third of the castle was finished before King Ludwig’s II untimely death a the age of 41 in Lake Starnberg. (See Solving Mysteries in the Starnberger See to see if you can figure out whether his death was accidental or murder). If memory serves correct, we only visited 5 rooms on our tour. Too crowded/requires advance planning. I like to be more spontaneous in my travels, but you can’t just show up during the summer and expect to get entrance to Neuschwanstein. Chances are it will be sold out unless you’ve bought a ticket in advance. When you’ve bought your ticket you will be given your tour time. It’s imperative that you make it on time, or you may be out of luck. From Munich it’s ~ a 2 hour train journey, then a 10 minute bus ride, then a 30 minute walk up the hill to the castle. You’ll want to give yourself plenty of time to get there, but if you arrive really early, you’ll find yourself waiting. There’s not much to do at the castle entrance itself. I was there in October and hadn’t bought my ticket in advance. I learned my lesson of the importance of advanced tickets as I waited outside in the freezing cold for 45 minutes. Little History. Neuschwanstein Castle may look old, but it’s quite young as far as castles go. It was built between 1869 and 1886 and opened to the public weeks after King Ludwig II’s death. It never served as a refuge for Catholics during the 30 Year War like Hohenzollern Castle did. Nor was it burned by the French once, let alone twice as Heidelberg Castle was. Too modern. I like my castles old and void of all modern amenities. 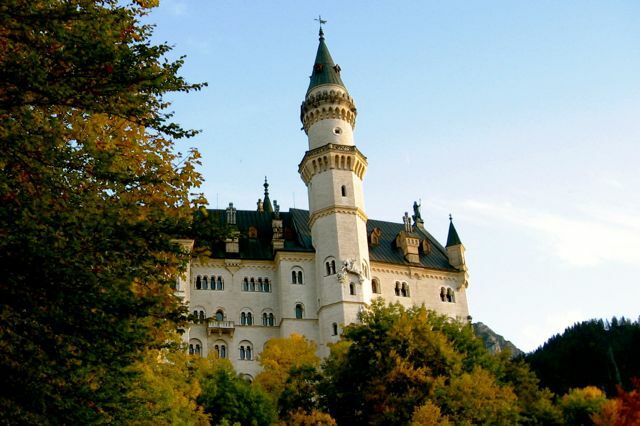 Neuschwanstein Castle was built for comfort with central hitting, running water, toilets, telephones, electric bell system to summon servants and even a food elevator! None of which belong in a castle in my humble opinion. Me posing in front of Neuschwanstein. Tip the best photos of the castle are taken some distance from the castle, not a the castle itself. If you really want to see a King Ludwig II Castle, then I would recommend Herrenchiemsee Palace on Lake Chiemsee. It was inspired by the Palace of Versailles. It’s by far the most elaborate palace I’ve ever visited and makes for a nice day outing. You get there by taking a boat ride to get to Herrenchiemsee Island, where the palace is located. It’s also very touristy, but definitely worth checking out. Check back soon for a post with more information. Despite everything I’ve said, I know that you will still probably want to visit Neuschwanstein Castle. No offence taken, I get it. The castle is beautiful from the outside with dramatic mountains serving as the backdrop. Travel tip: Visit the castle from the outside (the best views are from further away) and then do a hike. If you decide to do the castle tour try to go off-season, buy your tickets in advance and keep your expectations in check. Entrance is by guided tour only. Buy your ticket in advance at: http://www.hohenschwangau.de. Entrance costs €12 per adult. Neuschwanstein Castle receives up to 6000 visitors a day, so avoid going on weekends or in the summer if possible. It’s a 30 minute uphill walk to the castle so wear comfortable walking shoes. Alternatively you can go by horse and buggy at a cost of €5 person or by shuttle bus (which doesn’t run in snowy conditions e) €1.90 person. Check out the official site for Neuschwanstein Castle for further info. If you have decided to take my advice and visit another castle instead, then be sure to check out My Favorite Castles in Southern Germany. I also highly recommend The Munich Residenz (the royal residence in Munich) which doesn’t look like much as far as palaces go from the outside, but is quite impressive inside. I haven't been here yet, but I'm sure it is highly overrated. I'd still like to go see it, although I'm not sure I care much about going inside for the tour. Whenever we get around to visiting Munich, I'm sure we'll go see some of the other castles in the area too. I'm with you, I like the older castles much better. If it looks medieval, like it should have knights wielding giant swords standing at a draw bridge over a moat, I want to see it. I didn't go out of my way to visit the castle when I was in the area a couple of years ago. Friends had told me how beautiful it was, but I also like things to be older... much oder! Heidelberg Castle was the best castle I saw In Germany, but I know that's use the tip of the iceberg! Need more German castle action, that's for sure! We haven't been but it sounds just as overrated at Plitvice Lakes in Croatia. I think if we ever do go, we'll skip the inside tour and just see it from a distance. I really enjoyed my visit to Neuschwanstein. To take a photo of the castle from the wooden bridge was quite an adventure for me. LOL. I'm just a wee bit disappointed to hear that Neuschwanstein Castle is overrated because I have always wanted to visit! I really just want to see it from the outside and get a really good photo though so maybe it wouldn't be a let-down if I just skipped the inside tour or maybe I'll have to do a castle tour of Germany where it's just one of many! @Lisa - I visited it on my first trip to Germany. Good idea about seeing it from the outside, it really is beautiful from the outside. Also love your idea about doing a castle tour - then you have something to compare it with. That is the Disney castle??! No way! I grew up in Orlando and absolutely love anything Disney. I mean, I am surprised at how many people want to get married at Disney World, which I associate with a happy childhood... But then again, I don't want a wedding. ;-) As far as the actual castle: SWOON. Personally, I think Neuschwanstein is a gorgeous castle perched on its little hill and I still would recommend people go visit. The tour does lack a little panache and you do need to plan ahead and go early if going during summer. But the area is stunning. The climb up to the castle is wonderful as is the hiking around the grounds. Even with all the people in town during the summer, I love sitting at the lovely cafes soaking up the feeling. I haven't been to Chiemsee yet. I really like Linderhof Palace much better especially for the interiors. I'd never heard of this castle before and didn't know that it inspired Disney. The crowds alone would be a deterrent for me and 30 minutes is just not enough for any tour much less a tour of a castle, half-finished though it is. You mean, they couldn't beef it up to 45 or is it that they water it down to accommodate everyone. Oh, btw, I know you meant "central heating" not "hitting." Is it overrated because it is so popular which make visiting more difficult or because there are better castles out there? I visited Neuschwanstein in the mid 1990's and really enjoyed it but I do not think the crowds were as big then. @Jeff - Both. It's very new as far as castles go, devoid of much history and even has a toilet - which don't belong in castles in my humble opinion. Glad to hear you enjoyed it. I understand why people want to visit it, but don't think it should be the only castle they visit in Germany since there are so many older castles with a much richer history. Good tip! If I ever get there, I think I'll settle for the outside. € 12 for 5 rooms and a crowded half-hour tour is just not right. @Kate - Thanks for the backup :). I really like Lichtenstein as well, it's so cute and not very well known relatively speaking. Fascinating take on it. The first time I visited Neuschwanstein, I would have agreed with you (summer, crowded, etc.). But on our last trip, it was the dead of winter, we had the run of the place - almost completely empty. I've never actually done the tour, visited the fairytale castle a few times but only ever viewed it from a distance. You are right people won't stop visiting and the tips/info here is great. @Iain - You're not missing much :). I understand why people want to go, but hopefully now they'll have their expectations in check to avoid being really disappointed. @Days of Yore Travel - Great recommendations! I haven't been to Burg Eltz yet, but I keep hearing about it, so it must be incredible. For those who are still willing to give them a go, and they're in the beautifully scenic area, I'd recommend the trifecta: Neuschwanstein, Schwangau, and Lindau. I'm always intrigued by the castles in front of the the snow-capped Alps. I went with my parents a few years ago. It was a day trip on a big bus from Munich. I actually quite enjoyed it. The fact that the tour only lasts 30 mins was actually a positive for me. I hate getting stuck in the middle of a 2 hour tour when I was bored after 45min. I don't remember really feeling rushed. I definitely want to go back and do the hike above for better views. It is probably overrated, not because the castle is unworth seeing, but the hype gets overwhelming. The image gets on so many postcards and sent all over Germany. It would be very hard for it to live up to any of that hype. I want to see Schwangau as well when we head back. @Andrew - I definitely recommend the hike :). I get your point that sometimes a short castle tour is a good one, I enjoy self-guided audio tours for that reason. Agree it's the hype that makes it overwhelming, combined with Neuschwanstein's lack of history, and the fact that there are so many truly amazing castles in Germany. A group of 60 people on a tour really is too many! And we just don't do that kind of advance planning. I haven't been to Neuschwanstein and really value your opinion and tips. I totally agree that Herrenchiemsee Palace is worth visiting -- thanks for suggesting I visit there last December. @Cathy - Glad that you enjoyed the Herrenchiemsee. It's also busy, as you know, but I think it's something very special. It is ok to be disappointed by some tourist attractions, its all part of traveling...you don't have to like everything just because others do....be yourself, admire what moves you or speaks to you and remember to enjoy the moment. @AA Travel - Excellent advice! In spite of the all all aforesaid , this is my favorite castle. Awesome photos. Your tips are really helpful. I tried to explore this the last year but I could not get a ticket. @Muhammad Glad to hear that it was useful and sorry to hear that you couldn't get a ticket. It happens to a lot of people unfortunately. I think you are wrong. This castle is fantastic, so is its history. I know its crowded there, so what. I know entrance is 12 euros, so what? This is not much money. See it, I did. And I will be back. @Joe - Glad you enjoyed your visit. Everyone is entitled to their opinion. agreed. went there in 1991. visit was quite simple. no large crowds. group size was about 15 people. and no group breathing down our necks. fast forward to 2016. viewable rooms were cut in half (as some magical rooms especially the staircase is no longer shown). no photography allowed. a lot of protective plexiglass guards in place. and too many people per group every 5 minute. and can feel suffocating because too many people in such small rooms and next group ready to advance upon us from behind. no room to enjoy each room. agree about herrenchiemsee palace. largely unfinished. yet beautiful. and it contained modern features just like neuschwanstein (like dining table raised from the kitchen in the basement). Every one have their own dream but i have been dreaming from last 2 years to visit Neuschwanstein Castle, after reading your article i dream even more... Thank you so much for this great article, i wish visit to this castle soon. This says exactly my feelings. When the tour guide told us that it’s the last stop we’ll visit after 30min I was like shocked” wow it ends very soon”. I went there during December, -7 degree freezing walk and waiting outside makes the 2.5 hours trip from Munich rather tiring. I would say that this castle had nothing much to see when comparing to other European castles and royal palaces. I would rather spend 3 hours to Königssee again if possible. @Fei - thanks for sharing your experience. I'm also a big fan of the Königsee.